The Mesozoic Era was the "Age of Reptiles": dinosaurs ruled the land, pterosaurs reigned up above and huge marine reptiles dominated the seas. We tend to imagine mammals of that time as unimpressive, mouse-like creatures just waiting for an asteroid to rescue them from saurian tyranny, but that's not quite accurate. Meet Didelphodon vorax, one of the biggest and toughest mammals of the Mesozoic. Didelphodon fossils are found in the 66-million-year-old Hell Creek Formation of Montana and North Dakota, the same rocks that contain bones of Tyrannosaurus and Triceratops. This ancient relative of marsupials was no mousy fuzzball – at up to five kilograms (11lbs; similar in size to a European badger), it is among the largest known mammals of the Mesozoic. And new research has revealed that it had a nasty bite. "I've been interested in Didelphodon for some time," says lead author Gregory Wilson of the University of Washington. He notes that with its large size and unique teeth, the creature "sort of stands out". In order to calculate just how strong its jaws were, Wilson and his colleagues pulled together some rare Didelphodon skulls and jaws. Their conclusion? 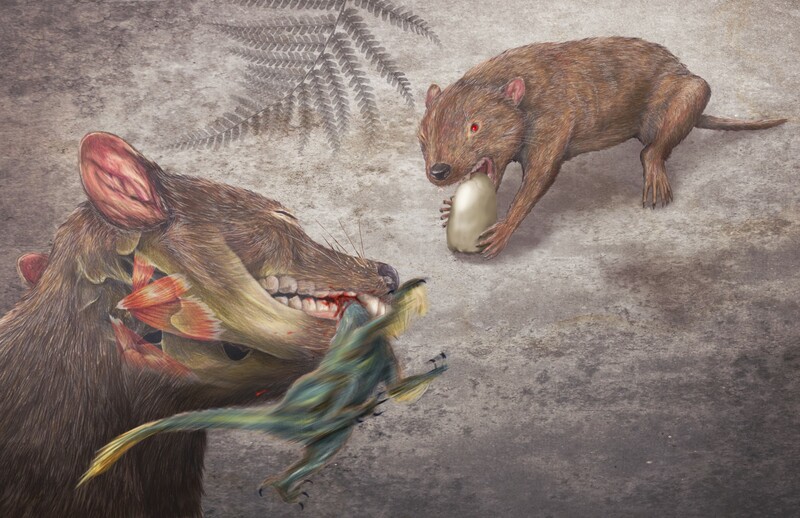 The ancient mammal had seriously powerful chompers. Relative to its body size, it had the strongest bite of any mammal ever measured – living or extinct. "The openings in the skull that allow the muscles to pass through the skull down to the lower jaw … are much larger than in other similarly sized mammals," Wilson says. Relative to the size of the skull, these jaw-strengthening features are even larger than those in big carnivorous mammals today. So what was all that power for? Most living mammals with such strong jaws use them for crunching through bones or shells – tough foods that not all animals can manage – and Didelphodon certainly seems to have been capable of that. 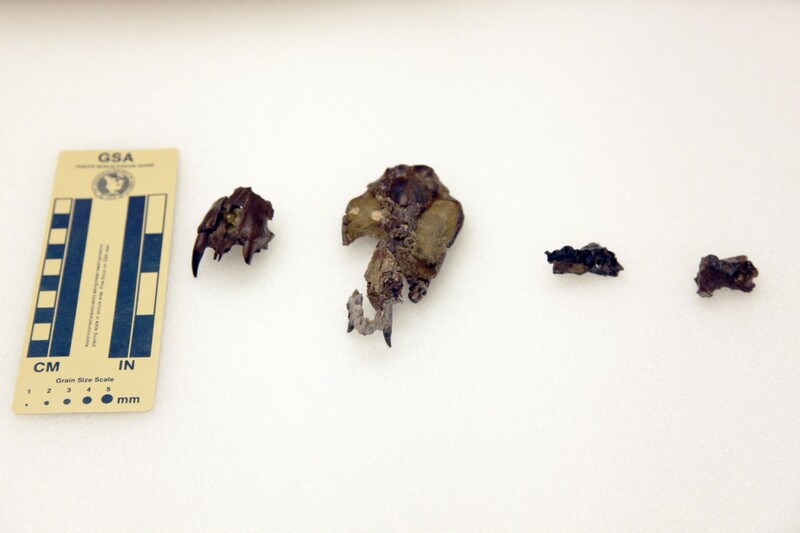 But a close examination of its teeth found signs of a varied diet, one that even included plants. The animal may have been just as happy gobbling greenery, catching smaller animals or snapping through the bones of a dead dinosaur. "I think it's similar to something like a honey badger or a Tasmanian devil, [taking] in a variety of different types of food, from scavenging to opportunistic eating," Wilson explains. 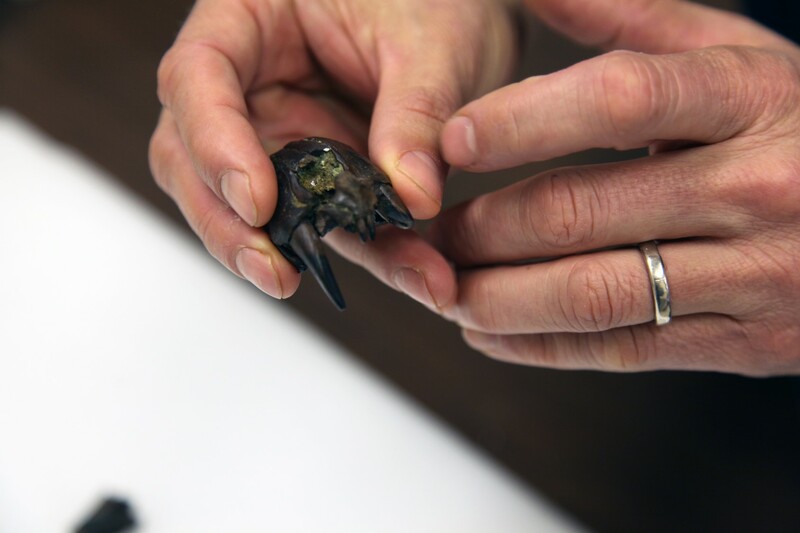 But he also cautions that it's difficult to compare Didelphodon to any contemporary critters. "There might not be a perfect [modern-day] analogy, and that's the beauty of the fossil record. We find diversity that doesn't exist today." That kind of surprising diversity has gone largely overlooked in Mesozoic mammals. "We have to give them a lot more credit," Wilson says. Mammals in the "Age of Reptiles" didn't get much bigger than Didelphodon, but they weren't all the same. We now know of gliders, swimmers, diggers and tree-climbers – and there are still more to be discovered. "Mesozoic mammals represent upwards of two-thirds of mammalian evolutionary history," says Wilson. "So they're very critical to understanding anything we want to know about the evolution of mammals." These fossilised skulls and jaws provided palaeontologists with incredible knowledge of Didelphodon lifestyle, diet and more. Image: Burke Museum. The fossils these researchers examined weren't easy to find – they were excavated from multiple sites over many years of digging. "There's a lot of hard field work and large teams that go unacknowledged sometimes that contribute to these fossils that go into museums," says Wilson. In this case, that work was done through the Burke Museum, North Dakota Geological Survey, University of California Museum of Berkeley, and Rocky Mountain Dinosaur Research Center. Once upon a time, the biggest, meanest, scariest predator in the ocean was an armoured monster named Dunkleosteus.